So, what did you do yesterday? 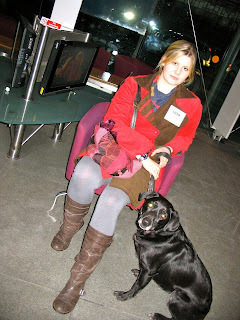 I took Pepper the Demon Puppy to Broadcasting House in London, that's what I did. And why, you ask? To audition for a new BBC3 show about badly behaved dogs. Being that Pepper barks incessantly, steals food, leaps on furniture, bullies the cats and thinks that hurling herself at someone, barking at the top of her voice (and that's a pretty big voice to get to the top of) and trying hard to shove them over is an appropriate way to greet both strangers and friends--well I thought she might qualify. And despite me being kind enough not to take her on the train but get my dad to drive us down there, what did she do for me? Behaved beautifully, that's what. No barking. Not even a whimper. Jumped once, in a pathetic, girlie, please-like-me kind of way. Didn't even pee on the carpet. So her TV career is over before it even begins? You know what? Today I even tried to email a video of her barking her lungs out at the doorbell, and my internet crashed. She has jinxed the internet. That's how evil she is. If bribes for good behaviour worked, she'd have started doing it a long time ago! No, she just lives to sabotage my every plan. I must marry a bona fide Cat Person and escape. Talli, I should have taken her on the train. She can't even bear it when a lorry drives past, a train would have sent her demented. But no, I was kind and considerate and she got to travel in her own basket in the car. And this is my reward!